For professionals interested in the development of the range smartphone of South Korean company Samsung, new data on the technical characteristics and the appearance of the device under the symbol Galaxy C10. According to the insider information of the Korean newspaper Asia Business Daily and Chinese JRJ.com the new smartphone has all chances to be the first device from Samsung that will feature a double main camera. Insiders have published renderings, visualizing the external data C10, from which we can conclude that the smartphone will be launched in two main colors: pink and black. According to the presented videos and images shows that the smartphone will be equipped with dual primary camera and dual flash. The approval of the Asia Business Daily at the moment in China are testing prototypes of the model Galaxy C10. According to information leaked in open access to information, the smartphone will be equipped with Qualcomm Snapdragon processor 660 (2.2 GHz) with Adreno graphics, 512. For the energy autonomy of the device will be responsible battery with 4000 mAh. The smartphone will have 64 and 128 GB of flash memory and 6 GB of RAM. In addition, according to rumors in the case of a shortage of CPU from Qualcomm, Samsung can use its own Exynos processors 7872 with 6 cores. The device will be installed in USB Type-C connector and 3.5 mm earphone Jack, on a separate button on the case will display the startup assistant Bixby. Galaxy C10 model with 64 GB will cost Chinese consumers at the same amount of 515 USD. 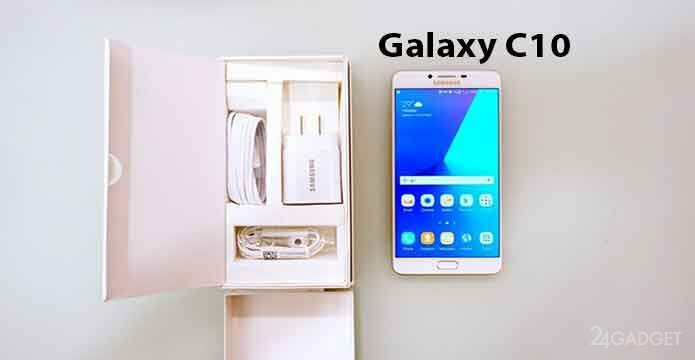 You are reading an article on the Specifications and photos of Samsung Galaxy C10 (3 photos + video). All materials on the site Gadgets F, а также и статья Specifications and photos of Samsung Galaxy C10 (3 photos + video) - written for the purpose of information enrichment and we are happy if you like our magazine.